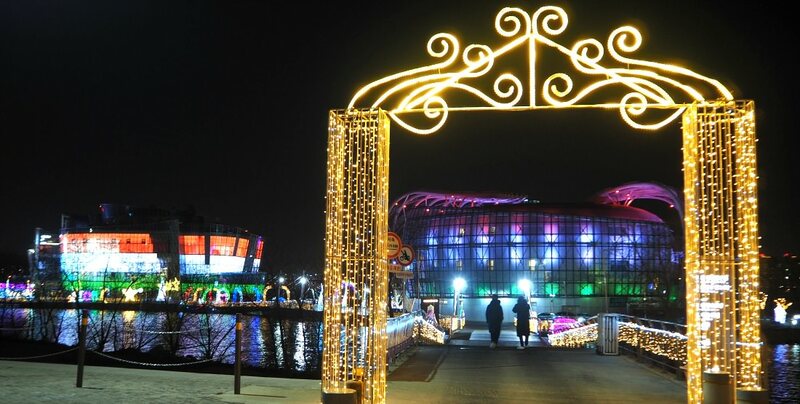 Banpo Bridge Park is an exciting place to see when darkness comes and its lights flashes with rainbow colors. Banpo Bridge Park in the Han River is located on the southern part of the river. Banpo Bridge (Jamsu Bridge) is one among the three bridges (the others being the Hannam Bridge and Dongjak Bridge). TRIVIA: Banpo Bridge is the longest fountain bridge in the world--Guinness Book of Records. What’s Banpo Bridge park is Famous For? As mentioned, the bridge has been especially built with a Rainbow Fountain on both of its sides. Owing to its colorful and fascinating effects, the bridge got registered in The Guinness Book of Records in 2008. Not because of its rainbow fountain alone but also because it is the longest bridge fountain in the world. Banpo Bridge has a total length of 1,140 meters attached with rainbow fountain. Wow! (Please note that the rainbow fountain show time varies. You may call the number down below to ensure you come without seeing anything. But, there is always that changing lights anyway! :). When the Han River (or Hangang) was being developed through a government’s effort called “Hangang Rennaissance Project,” Banpo construction was started. The bridge starts from Banpo Hangang River Park towards the other side of the river bank. There are over 200 powerful and colorful lights that brighten up when darkness comes. The effects are mesmerizing. Its rainbow colors (ROY G BIV-remember?) recreates the real rainbow at night. It is one of the best attractions in the park. Locals and foreign tourist come to experience this spectacle. (I remember my niece asking me about this bridge which she saw on facebook!). I believe the field is open all-year-round for all. Anytime, you can also watch skyscrapers, towering apartments, and other interesting structures in the area day or night over a cup of coffee (or tea). 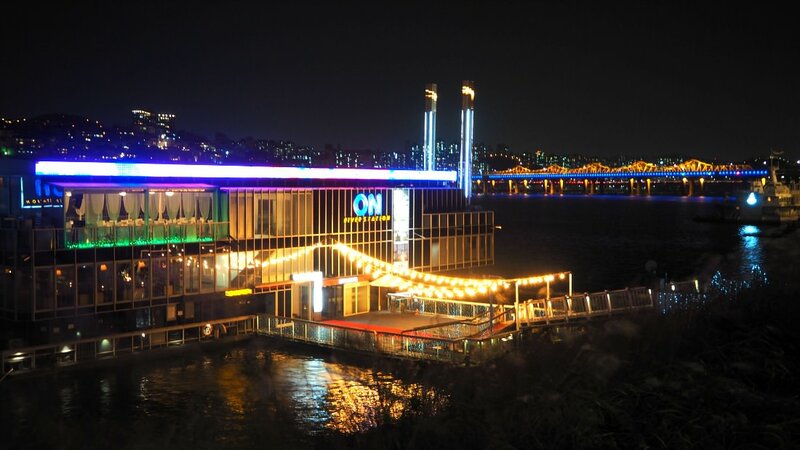 You will enjoy the fantastic view of the Hangang (River) and the skyscrapers from the riverside’s Gureum and Noeul Café. These are the special places where you can survey with your eyes the southern part of Seoul. 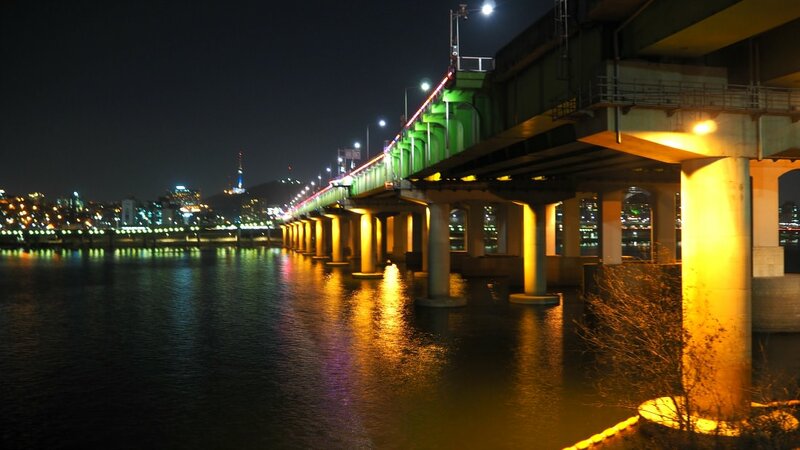 The cafes are located in the southernmost part of Dongjak Bridge. It is an island (river island) that connects from Banpo Han River Park. It is an artificial island created to provide a space surrounded by water for Seoul’s urban residents. During spring, the island is bedecked with Canola Flowers. People come to enjoy the sights while others stay longer to have a picnic. Among the popular events are the Canola Flower Festival and Seoraesoem Butterfly festivals. If you don’t know (yet), Han River has two long stretches of paved lanes available to the public who want to do some activities. Yes, no cars and other automatic vehicles allowed here. You can in-line skate, hike, run, jog, bicycle, and other similar activities. I have been cycling here for quite some time now (not recently, I confess! ^^). Also, you can jet ski, do boating, and other water activity, except swimming (not that very clean!). River Cruising is also available. It is more exciting if you do it during evening time—the night lights! Yes, there is a dinner on the cruise as well. (Phone: +82-2-6291-6900; Website: www.elandcruise.com (Korean only)). The parking area is available in a specific area, and one has to walk to their destination if possible. Washrooms are also available in many places. Thanks for reading this article. Hope this is useful. Please share if this is helpful to your search.